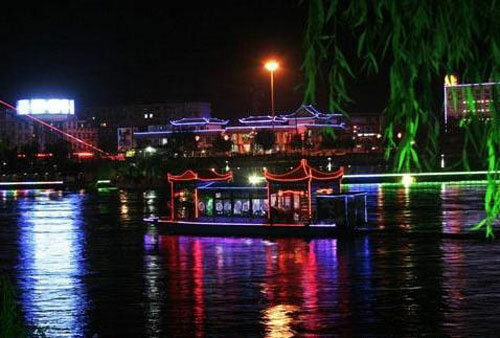 A new night tour route around the Yellow River will debut in Wuzhong, Ningxia Hui Autonomous Region, in this May, according to a recent tourism conference of the city. Head of the city's tourism bureau Jiao Yuzhu said the route features the combination of running water and solidified ancient-style buildings at both banks of the Yellow River in the region. Jiao said the banks will introduce art performances, featured food, souvenirs, sculptures and other fun facilities in a bid to build a "Dynamic Sleepless Town around the Yellow River" and attract more tourists. In addition, Jiao said the city will develop the local Hui and red revolutionary cultures to open new tour routes. Statistics show that Wuzhong registered 1.75 million visits and 950 million yuan (US$151 million) in tourism revenue in 2011, up 17 percent and 20 percent year-on-year respectively.